Does stock trading scare the bejeezus out of you? Well, it should – you can literally bet the farm on stocks and lose it within minutes. But a new mobile stock trading app/game called TradeHero may just help give you enough confidence to wade into that very scary stock investment space. 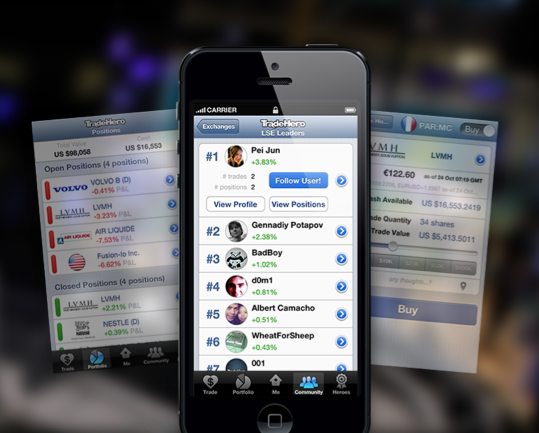 TradeHero, developed by Singapore-based tech startup MyManisku, is essentially a stock market simulation app for mobile devices that draws real-time data from 14 stock exchanges, 45,000 global securities and 1,300 currency pairs and allows users (gamers?) to simulate trades in game form. Users are given virtual credits – a starting sum of $100,000 – with which they can use to build their own virtual portfolios. It’s not directly linked to any trading platform so trades are purely fictional, but one can use the knowledge one builds learning from the game in real life. What’s interesting though, is that experienced traders with the knowledge and expertise and have the right track record can be accorded as ‘Heroes’, and other users can subscribe to their stock tips (for a small monthly fee) and receive trade updates from their chosen Heroes via push notifications on their mobile device. Even more interestingly, TradeHero actually incentivizes its Heroes by sharing subscription revenue from their followers, enabling them to monetize their trading expertise. This way, the platform hopes to connect casual traders with professional ones and “(help) to galvanize a global community of financial traders’, enabling the financial markets to be more transparent and interactive”. TradeHero was founded in Singapore in early 2012 by CEO Dinesh Bhatia, a well known entrepreneur in the Singapore startup circle, and CTO Dominic Morris, former head of e-commerce quality at Standard Chartered.